Shot with Drift 170 HD Camera in 720p. Watch in Full screen. So I have been back in the office, letting the AZ trip Matt and I just concluded marinate for about a week or so. At the moment I am still waiting for the insurance adjusters to call regarding the 2010 GS I enjoyed for the first 36 or so odd hours of the trip, but that is a story I will get into more during day two's recap. 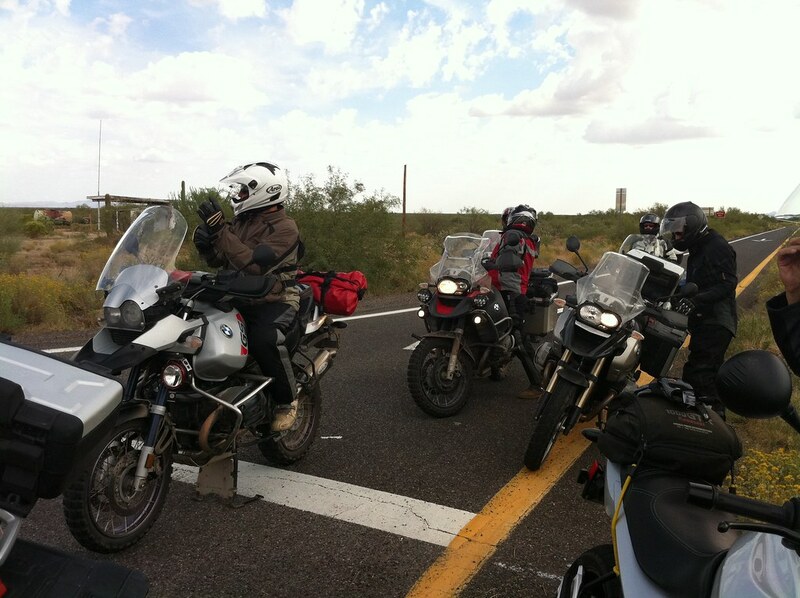 We flew in on Thursday, 10/17 to Phoenix and shot straight to Eagle Rider in Scottsdale to pick up our bikes and meet up with the rest of the squadron. As it turned out there were some last minute bailouts so we ended up with around 8 folks, down from 20 the year before. Upon arriving, Matt and I realized that I had misread an email and rather than having a chase vehicle show up nightly at our hotels carrying our bags, we would need to be packing our hardcases with all of our items, clothing and gear for the 4 day trip. All good, but unexpected and hilarious that our first task was trying to find shade in the Eagle Rider parking lot while completely pulling our luggage apart and jamming everything into the top and side cases on these rental bikes. Sad clown moment #1. 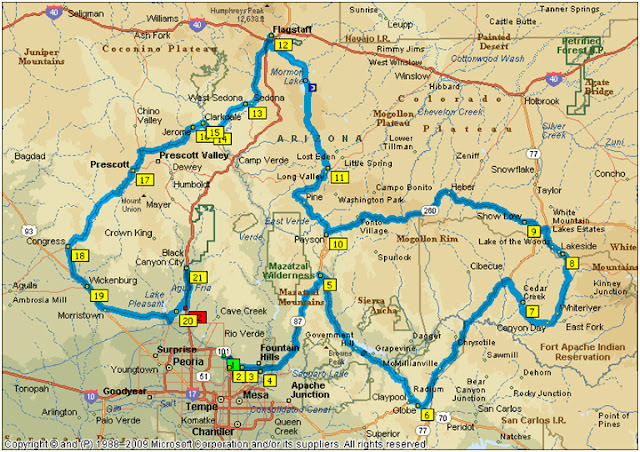 Our plan was to leave from Scottsdale (#1 on the map above) and make a counter-clockwise loop around the surrounding Arizona destinations, with Flagstaff being at the 12 O'clock midway point. We were planning on averaging about ~250 to 300 miles a day at pretty uptempo pace. If there's one thing I have learned from these western and mid-western industry rides, it's that they are not for the faint of heart, and somehow it's an unwritten rule that pavement and traffic markings seem to be only taken as suggestions. I am still digesting that riding style, as the East coast is typically much less forgiving of the two wheeled liberties we took in dealing with slower motorists, stop lights and double yellow lines. 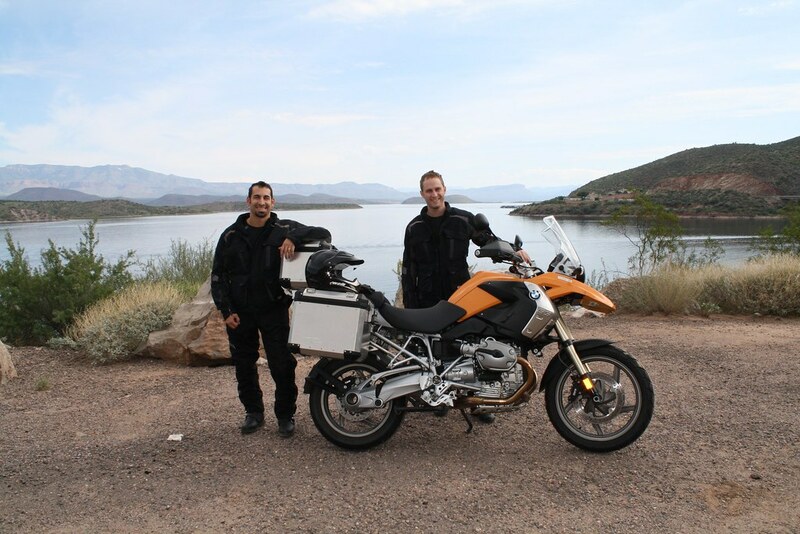 They set me up on a low mileage 2009 Namibia Orange R1200GS with the steel BMW cases. 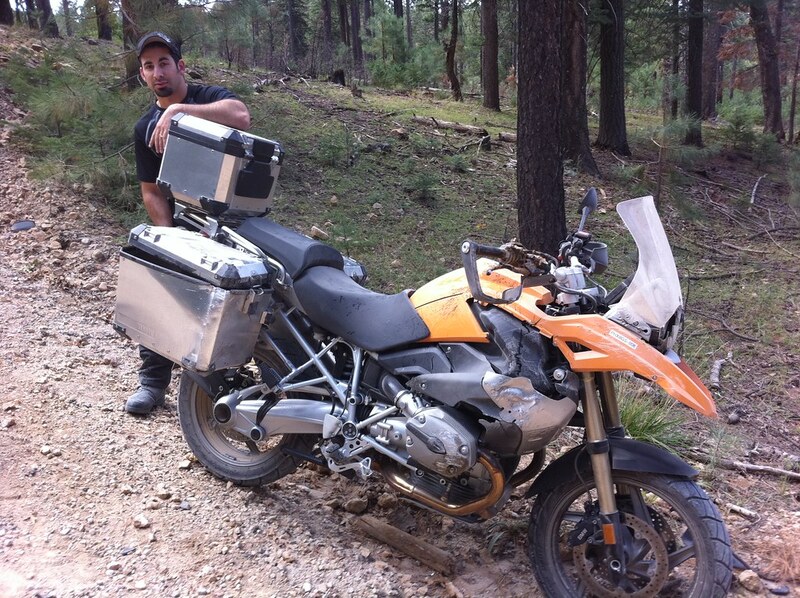 Matt was on a black 2010 R1200GS with a low seat and the plastic beemer hardcases. We both wore Firstgear TPG Rainier Jackets and the new for Fall 2010 redesigned Firstgear HT Air Overpants, which are mesh composite and designed for the heat. I was wearing an Arai XD-3 Helmet and Matt had on a new Arai RX-Q Touring Helmet. We had Cardo G4 Bluetooth Headsets on both. The goal was to put 900-1000 miles on some of the new gear in a warmer temp range to really get a gauge for performance. DAY 1 - Scottsdale to Pinetop - 247 miles. Scott and Joe contemplating the meaning of life....or talking about "final drives" again. 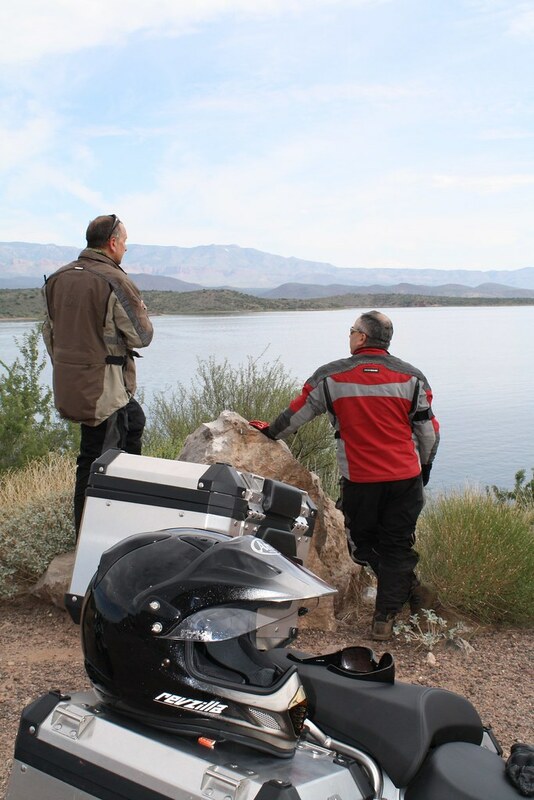 We made it to Roosevelt Lake before lunch for a quick stop. Then rallied and shot down to the Roosevelt dam which was pretty cool and just rebuilt in the last 20 years. The temperature range had dropped once we made it out of Scottsdale and this was beautiful mid-70's riding at its finest. Roosevelt Lake was noonish and we still had not eaten, so we hopped back on the road toward our eventual destination of Pinetop which was still about 150 miles away. The next stop was Judy's Cookhouse which was the essence of a Southwest diner nestled in the middle of nowhere. I say that with love. Fried Chicken and burgers hit the spot a Judy's followed by a 5-hour energy to counteract the food comas we all were fighting post lunch. There was no room to be sleepy on this ride. From Judy's we shot down to Salt River Canyon for some more twisties. Really amazing riding. Nearing the top we hit a 15 minute cloud burst and quickly pulled over to close up our vents. The waterproofing is 100% my favorite part of the TPG Rainier Jacket. The waterproof breathable membrane is bonded to the outershell and never needs to be put in or taken out - you have it all the time. The Rainier jacket becomes instantly waterproof upon closing the vents. The Firstgear HT Air Overpants are Mesh and we did have the liners out so our legs got a bit wet, but it was not enough to try to stop to throw our liners on. Matt had REV'IT! Rival H2O Boots and I had SIDI Adventure Rain Boots so our feet stayed quite dry. Expected. It's nice when the high-end gear does it job. 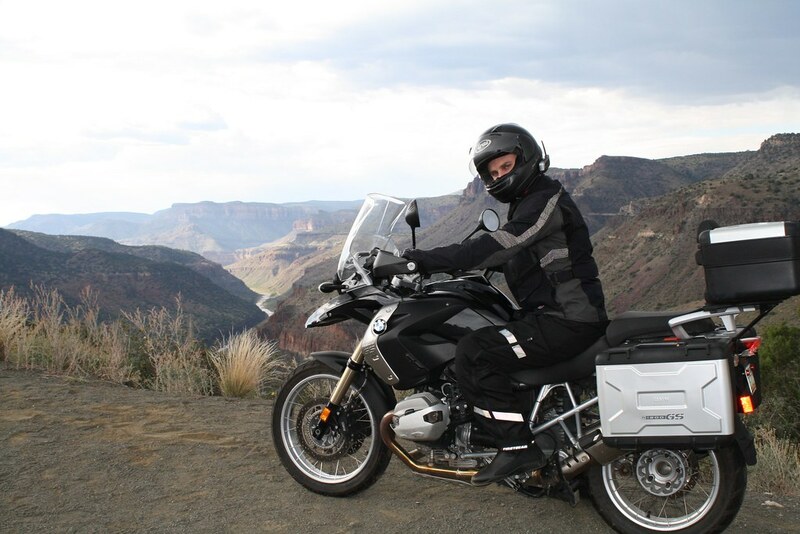 Here is Matt at the top of Salt River Canyon on the way to Pinetop. Toward the bottom of the Salt River Canyon we did some riding standing on the pegs which was awesome to get some evaporative cooling on our legs as we hit the low lying heat again and then shot over to White Mountain where we lost a rider and had to send Joe on 10 miles of speed limit breaking to go catch Mark as he unfortunately had zipped past us stopped at a gas station, continuing on in the wrong direction. From White Mountain we headed off to Pintetop and the lovely Hampton Inn. It was a good days ride comprised of nearly equal levels of excitement and relaxation. A much needed respite from dreary old Philadelphia in October. 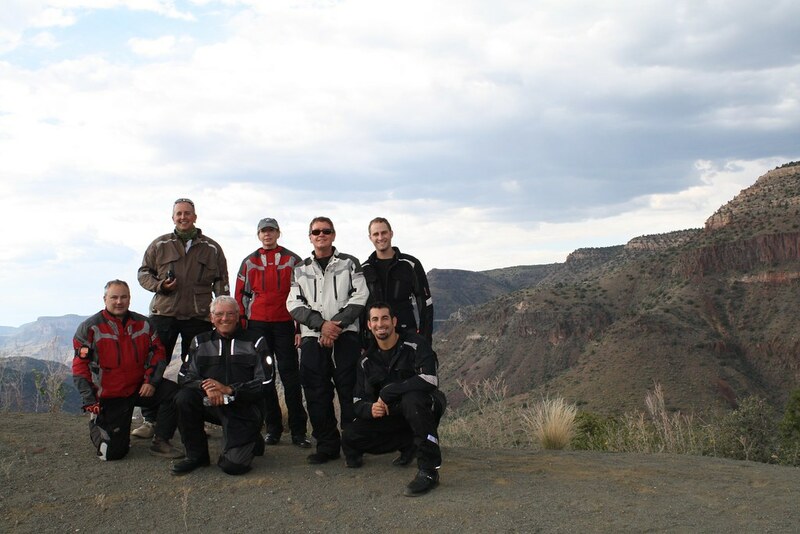 The Crew pulled over atop Salt River Canyon for a group shot. The night ended at a great Mexican restaurant in Pinetop called Los Corrales. Chimichangas and marg's for everyone. My last memory was practically hallucinating, fighting sleep on the hotel bed, to stay awake to watch one of my favorite Philly Chefs win on Iron Chef. Day two was fun. It started out harmlessly as a ride from Pinetop in the mid-40's then turned hairy, then a mess, and eventually a hairy-mess. You have to love the true spirit of the Adventure ride. This is where the 3rd bike for two guys comes into play, unfortunately. We had a diverse group and decided that we wanted to take a detour that day and head around the Mongollon Rim on what they call Rim Road 300 which is basically about a 30 mile fire road which goes from double to single wide in a few spots and really is not that challenging other than a few blind corners and some steep ups and downs - all sans mobile phone reception. We bid farewell to the two riders with us on true street bikes and we took our fully loaded 12GS's with luggage and we hit the woods at a reasonable pace. The road was twisty enough to keep us interested and the pace and conditions were enough to keep us challenged with our collective lack of knobby tires. All was well until we made a hard right that quickly dipped through the trees and bunched the three of us riding together up. Matt tapped his breaks, I unfortunately reacted to him and tapped them some more and Mary who was riding behind me got to watch me wash out pretty good at about 30 mph on my right side. Rider down. Sweet. I've crashed on the road. I've crashed on the dirt. It's nothing new to me. When you ride and you challenge yourself you eventually go down. This was the first time however that as I made my descent from standing on the pegs decelerating down hill, to slamming on my right side and watching this beautiful bike basically explode - I recognized the whole event as it was happening. I even remember seeing the stars when I slammed. Now I am not sure that its the speed of the crash that dictates the "forget the fall" factor, or if the adrenaline bump is what gives you that quick blank to your flash memory which keeps you from really remembering the crash. How did I go from riding to laying here? For me this was the first time that from riding to crashing to pulling my gloves off to brushing the dust off and checking for blood and broken bones- I remember it all. The first thing I did was immediately wonder what was brown and wet and all over me. I was happy when I realized it wasn't blood. I was even more happy when I realized that I hadn't messed my pants. The gravity of the situation did set in when I realized that it was the brake reservoir - which exploded - that was all over the bike and I. Not to mention the throttle linkage, hand grip and bark-buster were annihilated. Oh and did I mention that the right cylinder head was now spewing oil and the only thing that saved me from ending up under the wreck was the now destroyed right side-case which had my laptop in it. Rad. How the hell am I getting back to the road? The spiffy new beemer was now officially unrideable trail-toast. Sacrificed in the name of the dual-sport gods. I was at mile marker 13 of a 30 mile mountain fire road without a sliver of mobile phone reception. How was I getting out to HWY 87? 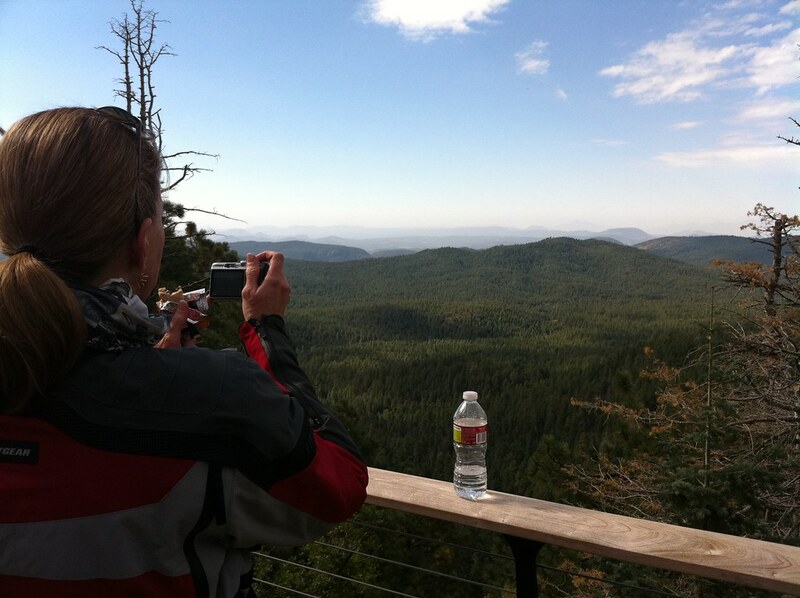 How was I getting to Flagstaff or Sedona? How was I getting lunch? Ahh dammit. This was beginning to look like a cluster. My riding today or for the weekend could be done. I sent Matt and Mary out for "help" (see Matt's pic at right as he pulled away) and I sat there in complete quiet on my top cases, in the sun next to a wrecked GS propped up on a log. (Look I took a panorama!) It was actually really serene and I couldn't help but notice that there was no wind, no bird noise, no cars and no one else. There was a solid 5 minutes where I could not hear anything but the sound of myself breathing. I don't think I have ever experienced that in my life. It was actually pretty neat. I was ready to be eaten by a cougar or the Mongollon Monster at that point, but in that quiet time I hatched a plan. I quickly disassembled my side cases and got my gear together. After about 20 minutes I heard the faint sound of a motor as it grew closer. While I expected to see a truck or quad come around the corner, I was greeted with a 70 year old man and his wife in a Chrysler 300m. Yes it's as ridiculous as it sounds. A maroon Chrysler 300m. On a dirt road. On a mountain. Driven by two septuagenarians. At 12:30pm. On a Saturday. Sight-seeing?!? WTF? After I flagged them down, I convinced them that I would try not to get their back seat dirty or kill them, they let me load up my non-mangled side and top cases with my luggage into their trunk and climb in. 13 miles to out. Let's do this. Loell rode like the wind and his wife was a hell of a cheerleader. I just held on. At the end of the road the rest of my group was as surprised as I was to see a 300m emerge from the wooded trail and even more amazed that they let me ride in the back; dirt and all. I learned at that point that we lost half the group including Matt. We were 100 miles from Flagstaff. Lunch was no where to be found. 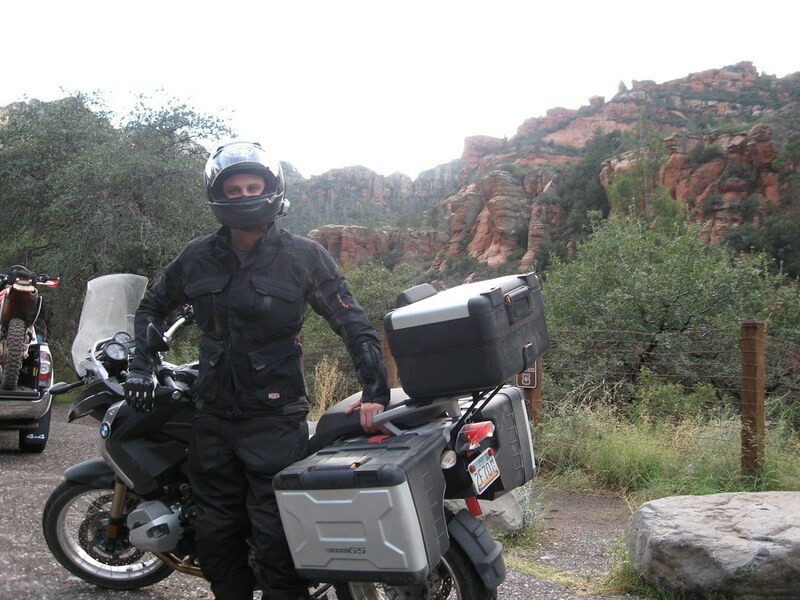 I also learned that one of our guys with service called the Eagle Rider at 12:45pm and a new 12GS was going to be brought up from Scottsdale to me with a truck to go fish the wrecked bike out of the woods. Sweet. At this moment I laid down in momentary defeat. It was about 2pm. It was now about 1:30 and the new bike was at a minimum 2 hours away. The next stop was Flagstaff, which I had no way to get to. I divided up my gear from my cases across Joe, Scott and Mary's bikes - wished them good luck in finding Matt - and with all my dirty and beat up gear hitched a ride to the nearest town. 30 miles SW to Payson, AZ. Bert, the bricklaying mountain man / good samaritan that gave me a lift dropped me in a shopping center after 30 miles of small talk and we bid farewell. Thanks Bert - if you ever read this. I wish I had a pic with you. You were a regular fellow from the South West. You were what I expected. You were an all around good human and you helped me out. 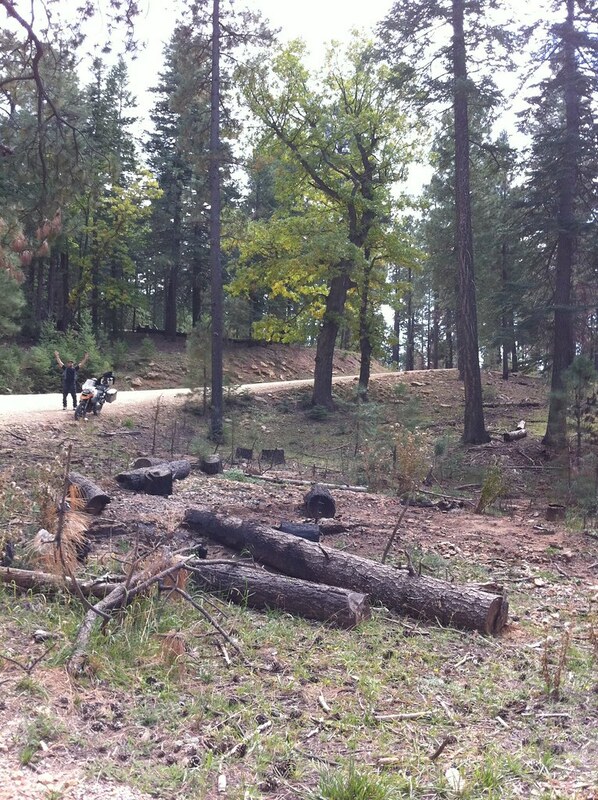 I walked into Mackey's Grill in Payson at 3:30pm covered in bike destruction. I asked to hang for an hour as my new GS was on its way. 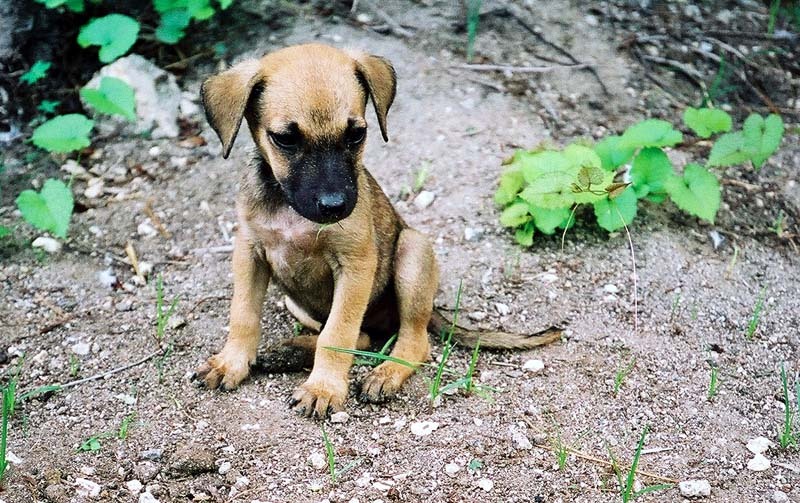 Thank god that place was run by high-school girls that wanted to save a lost puppy that day. Because I was their puppy, and after 4 hours I was still there. There were apparently bike delivery "issues" and after 5 cups of coffee, a steak, a piece of pie and a lot of boredom, the bike showed up on the back of a flatbed. The 3rd bike had now arrived. After pulling the bike off the bed, the driver then turned to me and asked: "So where is the wrecked bike?" How did he not know? This was sad for both of us and a problem. 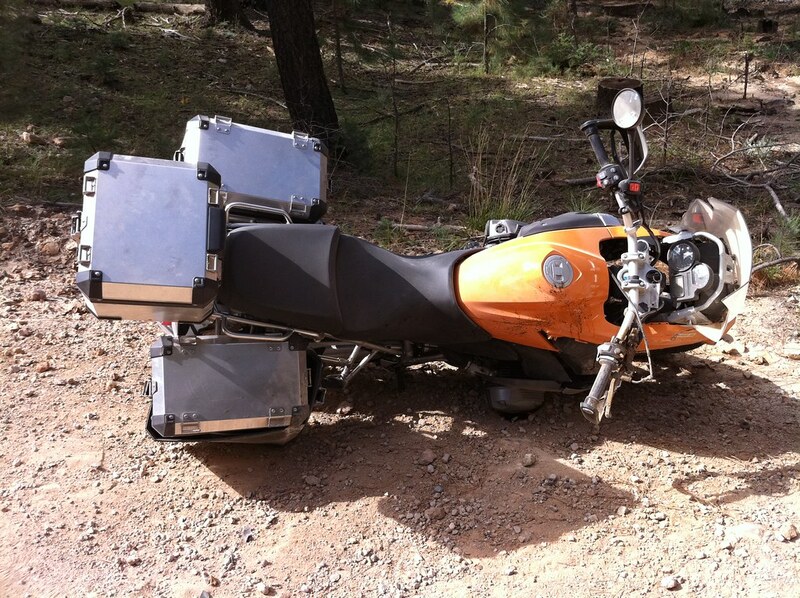 The bike was 27 miles up HWY 87 then 13 miles into the woods. I was sad because the cost of the tow-job just probably went up for me significantly and the tow truck driver was equally sad having just realized that he was going to have to drive 13 miles into the mountain woods alone in the moonlight to go pick up a wounded GS which had previously been left for dead on a single lane dirt trail. Man, we could have both used a Miller High Life at that moment. I bid farewell to the Mackey's Grill parking lot and began my solo ascent 130 miles into the darkenss from Payson to Sedona to meet up with the group. Where 87 meets 260 in Strawberry AZ, about to head to Sedona in the dark. At this point I had missed dinner, I missed Flagstaff, I missed most of Sedona and the red rocks, I missed the Phillies game and now I had to hope for a critter free night ride on Rte. 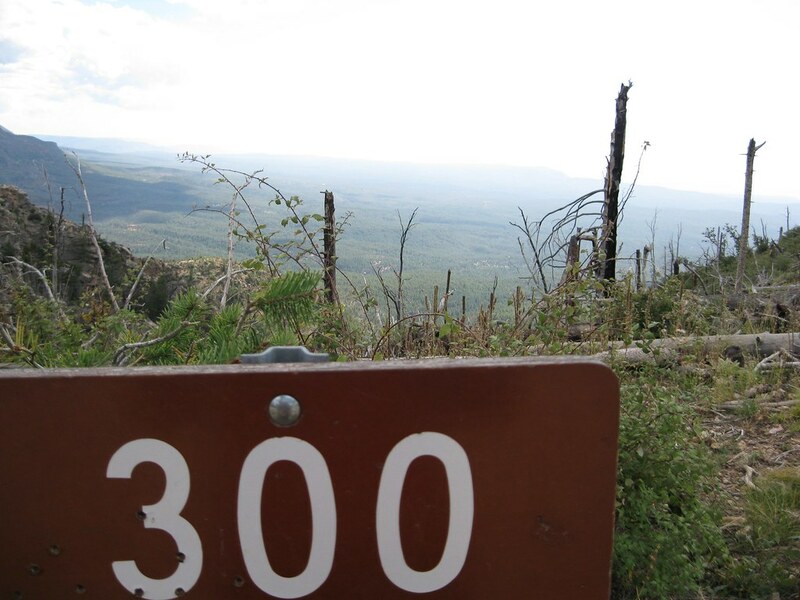 260 through Camp Verde to Sedona with no mobile reception or life-line to the world. If I had hit an Elk it was all over. I arrived a solid two hours later around 9:30 at the Day's Inn Sedona, just as everyone was arriving back from dinner. Not surprisingly, the two hours solo on the road from Payson to Sedona was probably one of my favorite parts of the trip - except for the frantic messages from the tow driver who could not find the bike in the woods and ended up not picking it up. There is just something about being alone on a bike in a strange place devoid of certain senses and distractions that usually cloud your chances of really experience what is at hand. Some of my favorite times to let my mind wander are all by myself on two wheels. I have a feeling that there are a large number of riders out there which may share a similar sentiment. Day 2 ended for me with a Miller High Life (they had one waiting for me), a good story and a Lunchable from the Circle K across from the hotel - its all that was open - and I hadn't eaten in hours. I was happy to have my place back as one of eight vs rogue adventurer / sad clown. Did I mention that Matt, although we lost him off of Rim Road 300, had miraculously made it to Flagstaff on his own, rode right up to the group, had a delicious lunch and got to enjoy the red rocked riding of Sedona later that afternoon. As you can tell I am not at all bitter. He also had prime rib for dinner while I was at Mackey's. Like I said, I am not at all bitter. Seriously. I'm not. Here is Matt in Sedona, not really wondering if I died, with a full stomach. So other than my Sedona hotel room smelling like the Grateful Dead had been there the previous two weeks, the fiasco portion of my trip was finally over. It was an absurd 9 hour debacle which apparently was unavoidable. Did I mention the orange crashed bike was still in the woods? According to the tow company, they had made it to mile marker 12 of the Rim road and turned around when they knew the bike was at mile marker 13 - apparently the night was too dark. Awesome. 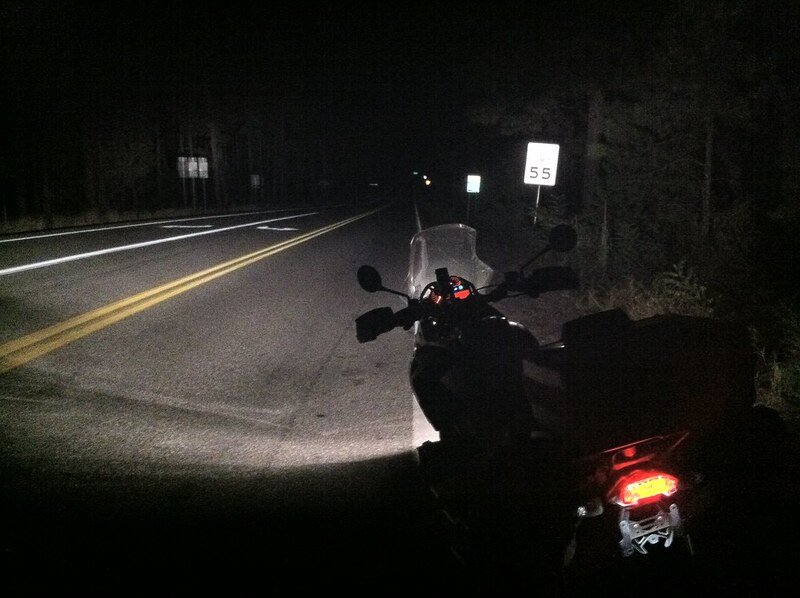 I was having nightmares of Sasquatch parting that thing out all night on ADVRider. The only saving grace was that it had forged wheels which are less desirable than the cross-spoked - so I am hoping that was a deal-breaker for would-be thieves and they let it be. After the adventure we had, had over the previous 48 hours I was really thinking that day 3 was going to be flat in comparison. I could not have been more wrong. We left Sedona and shot up to Jerome on 89A which was one of the best roads I have ever ridden - both in and out. Let me repeat, 89A to and from of Jerome is one of the best roads I have ever ridden. 12 Blissful miles. Sweeper after sweeper with tight switchbacks inbetween. There are few roads in the states that I would place in the same elite class of that stretch. We took it all the way up to Jerome where we made a brief pit stop only long enough to make a lap around the block while making fun of Joe for being scared of ghosts incessantly. As our heart rate slightly lessened we shot down to the Ranch House in Yarnell for some amazing side of the road, hole in the wall, home-made Mexican food. From the Ranch House in Yarnell it was off toward Prescott, then back to Anthem for the night until an accident forced us to detour through Congress, AZ to get around a multi-mile backup. We saw an everglade Air Boat and a TransAlp go by on the same trailer while stopped here. From the detour to Anthem, the hotel pool and a 12 pack from the Gas station was only an hour or so. Denny's for dinner. Seduced by "Moons over my hammy" once again. Ride complete. 30 miles to Scottsdale bright and early and a full day in the airport. New friends, new roads and a slew of new stories. It was also a blast to have Matt along with me for the adventure. The crew was a dynamite group of riders from all over the states and they were all riders who took great pride in representing a sport and industry which deserves a better reputation than what is usually is given. I am not sure if this is how you do Arizona, but I enjoyed it - at least until I get the deductible. Firstgear Rainier Jacket - Overall I was equally impressed with with the performance of the Firstgear Rainier Jacket from both a weather and protective side of things. 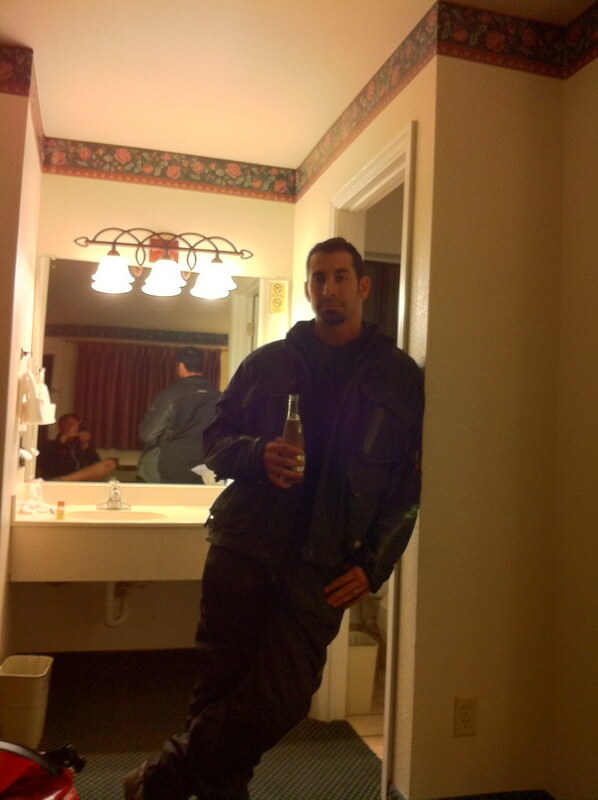 It vented when it was hot and in Pinetop when it was cold it more than covered the chilly bases. I will say after crashing in it two years in a row, that the d3o molecular does a great job. They were two pretty good slams ans while I did have a bruised forearm and elbow, it barely even got sore. Without the jacket on it would have easily ended up with a broken arm. I 100% hit that hard. My only gripe with the setup of the jacket is that you have to make sure the elbow armor is correctly lines up or else you may feel the Velcro a bit without long sleeves on. If you do feel it it is nothing that a quick armor adjustment can not fix. Firstgear HT Air Overpants (2010) - I have worn the 2009 HT Air Overpants. There is nothing overly exciting about them. They were a basic warm weather commuter pant. I knew going in that based on my previous experience with the 2010 HT Air Overpants, at longer distances they should be even more of a pleasant surprise compared to their much less well designed 2009 counterparts. The first thing I noticed wearing my set of 32s was that depending on the position of the bike I was going to absolutely take advantage of the ability to move the knee armor pocket 3" vertically and between 1.5 and 2 inches horizontally. The first day I noticed that the armor position I had set was rolling the armor toward the inside of the bike too far so I moved it a bit laterally to correct this. I tested that knee armor on day two by crashing on my right side. Not the most pleasant of experiences but the armor did it's job and I walked away without limping. As far as warm weather breathability, they performed well. I also used them for a few hours with the liners in on the beginning of day two to combat cold and they did a good job at blocking the wind. As I mentioned on day 1 I opted to let my legs get wet while riding Salt River Canyon into some moderate rain. The pants and my damp drawers dried quickly at speed when the rain ended. SIDI Adventure Rain Boots - Shhh - don't tell, but I definitely wore SIDI boots on the Firstgear ride. I was expecting a bit of a gnarly trip this year so I wanted to beef up to a boot with shin protection and a more protective husk as a whole. I get shivers thinking about the typical touring bike wreck involving a footpeg meeting a shin and taking a left at the ER. The Adventure Rain's were comfortable and since I had already broken them in, they did not miss a beat. It was also not my first time wearing them in the rain so I knew what to expect there and they held up as well as usual. The new experience I had with them was when I dumped the bike. Like low sides before, many times you end up with a foot under the bike sliding between the bike and the ground. This time was no exception and the ground by being a mix of hard packed dirt and protruding rocks offered an uneven surface for sliding. The reinforced boot hard parts did a good job deflecting the impact and the weight of the bike and "stab" of the foot-peg. The Cam-Lock buckles all took a beating with out breaking as well. On day three I has some bruising and stiffness in my elbow and knee but not so much as a mild bruise on either feet. Great write up and sorry about your accident. Did you have ABS off? What a strange fall if it was on. ABS was off, tire pressure was dropped. It was wacky.. and sucked! Repeat after me - R1200GS is NOT a dirt bike. At least it wasn't your bike and you escaped uninjured.